Да ради этого все и затевалось! Сделаны они по разному. В нашем музее мы стараемся собирать только различные конструкции ламп и приборов независимо от их художественной ценности. Предпочтение отдается уникальным и редким образцам человеческой мысли приложенной к предмету собирания. Весьма интересны патенты. Рекомендуем для изучения. Не все они нашли применение в жизни, но направление мышления демонстрируют. On pressurising the fuel tank, Paraffin, (kerosene), is forced from the fuel tank through the vapourising tube. The vapourising tube is pre-heated by methylated spirit, (alcohol), in a torch cup clipped around the tube. A fine spray of hot paraffin leaves through a jet at the top of the vapourising tube and on entering the mixing dome vapourises into a gas. Air mixes with the gas and the mixture leaves the burner through a ring of holes, it then passes into the mantle which is suspended below. Inside the mantle the gas burns and causes the mantle to glow with a bright white light. As the vapourising tube passes throught the centre of the mantle the heat from combustion continues the process started by the pre-heater torch, this feature also gives a clear shadow-free light. Inside the vapourising tube is a cleaning needle which 'pricks' the jet every time the lamp is turned off. Should the jet block in use it can be cleared by quickly turning the lamp off then on again. A match should be kept at hand should the lamp fail to re-light. 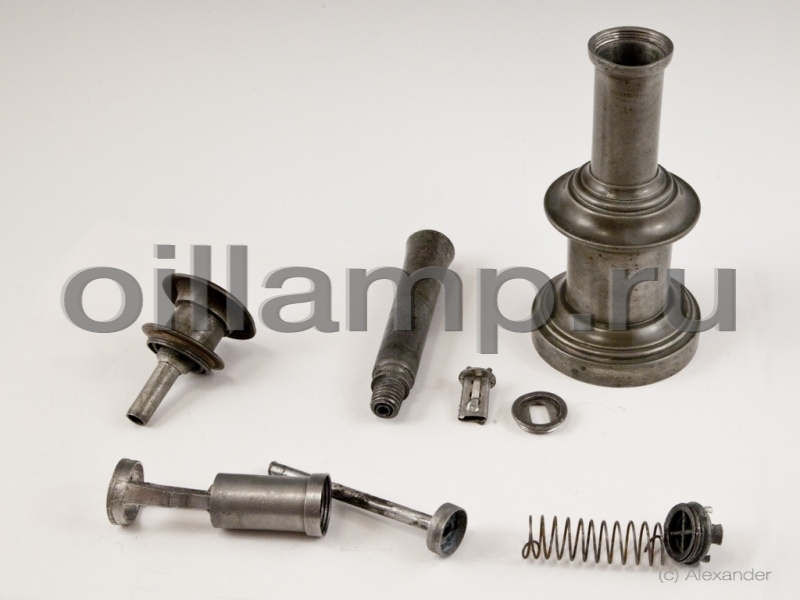 This vapourising principle also applies to other paraffin, (kerosene), lanterns manufactured by other companies such as Vapalux, Bialaddin and the 'swan neck' lanterns such as Coleman, Optimus, Magnalux, Anchor, Petromax etc. The Titus-Lamps were made by Auguste Tito-Landi (1873-1947), an Italian citizen living in Paris, from early in the 20th Century (before 1910) until the company closed down in the 1970s. They are very common in France, but you must have some accessories if you want to have them in functioning condition. First of all, you must check if the lamp you have is made for alcohol or unleaded gasoline = petrol (car fuel). The most reliable detail to tell is the injector's size: 0.3 mm - 0.4 mm for gasoline and 0.7mm - 0.8 mm for spirit (alcohol). Лампа с вентилятором. Воздух дует - пламя светит. Удачная конструкция, стекла не надо. Наливаешь растительное масло. Качаешь вверх-вниз. Масло поступает к фитилю. Горит. Если зажечь. Чистить трудно. Сделать рабочей еще трудней.